The Amish Deluxe Clockbase Jewelry Vanity offers something special for your bedroom furniture collection. 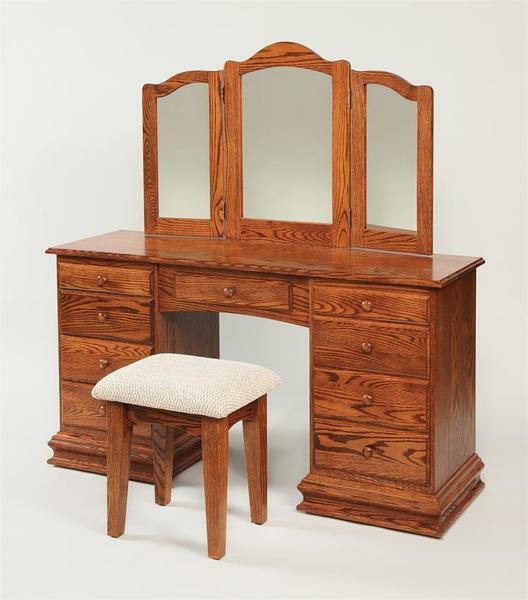 This solid wood dressing table is a masterpiece, handcrafted with the wood of your choice. With a tri-fold mirror on top and a luxurious collection of storage drawers at your fingertips, this Jewelry Vanity makes getting ready for work, date night or bedtime simply divine. Nine dovetailed drawer boxes rest on full extension slides that offer access to the most space in each drawer. Each storage compartment is lined with black velvet drawer linings for a luxurious look and feel. This Amish made vanity table is 56" wide and 17 1/2" deep. Select the wood and finish you like best for your bedroom decor and consider a matching Amish Upholstered Dressing Table Stool to use with this Jewelry Vanity. Plenty of room is provided to neatly store cosmetics, perfumes, jewelry and hair accessories. Avoid clutter in your bathroom and enjoy plenty of organization in the Deluxe Clockbase Jewelry Vanity. A jewelry vanity makes a great gift for someone special. Consider our Revolving 10-Drawer Jewelry Armoire for another option.